Riding a bike doesn’t only serve as a physical exercise, it also allows us to save money spent on car fuel or public vehicle fares, and protect the environment from harmful pollution that causes global warming. If you are an enthusiast and you want to bag all these benefits, owning a bike is certainly a great decision. 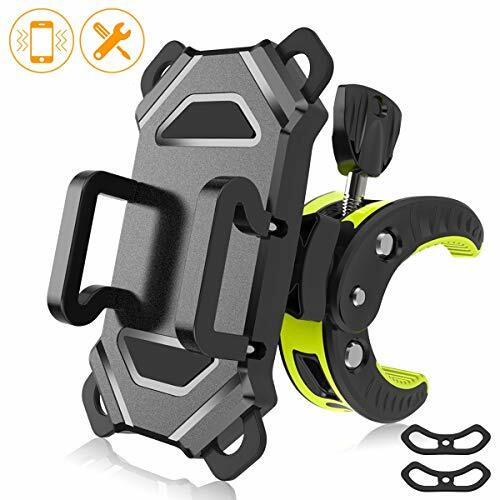 However, keep in mind that you must always be protected when traveling by having a bicycle phone mount which you can use to navigate and access your device quickly and safely. There are numerous bicycle phone mounts available in Amazon and other online selling platforms. Because of that, it can be a bit confusing and challenging to choose. We have collated the best bicycle phone mounts in the market to help you decide. Review each product’s specification so that you can find something that meets your needs and preferences. For iPhone users, Quad Lock’s bicycle mount kit is probably the most popular one. They offer several kits depending on what type of iPhone you have. It’s a bit pricey as compared to universal phone mounts but once you have received it, you will immediately understand the price point with its sturdy structure. It comes with a holder, four o-bands, two zip ties, a clear protector (called Poncho) that protects your phone from water, and the actual black phone case that you will attach to the holder. To install, you have to connect the bands to the holder, then put your phone inside the black case. Tilt your phone for about 25 degrees, then adjust vertically or horizontally. It’s very simple and does not require you to use any special tool. However, unlike other phone mounts, the Quad Lock isn’t designed to be completely waterproof – no special plastic that will keep your screen safe. The Poncho is intended to keep the ports from getting grime or water, so in case it rains, you have to put it on top the black phone case, covering your screen. This universal phone mount from Sunby provides great value for money with its effective and versatile design. It is known for its unique metal crow foot clamp because it’s an effective and stable mounting system that fits any handlebar size. It is also supported with rubber so that it won’t slide off, especially when it’s raining. 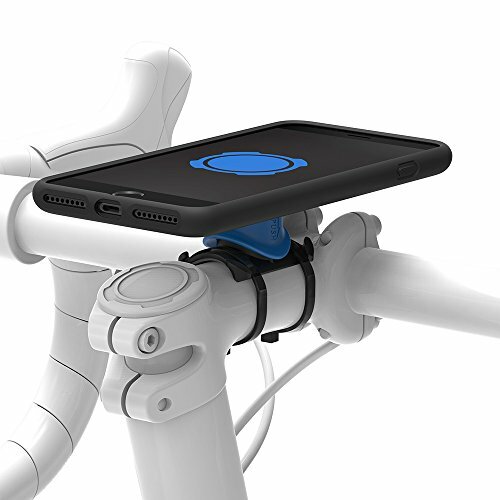 The Sunby bicycle phone mount can hold devices measuring 3.5 to 6.5 inches. You don’t have to remove your protective case every time you go for a ride because of its adjustable phone holder on each side. For added protection and to minimize the vibrations when you have to drive on rocky terrains or steep mountains, each corner has a rubber band that will firmly grip your mobile phone. The actual mount can be rotated for up to 360 degrees to help you find the best, comfortable viewing angle. 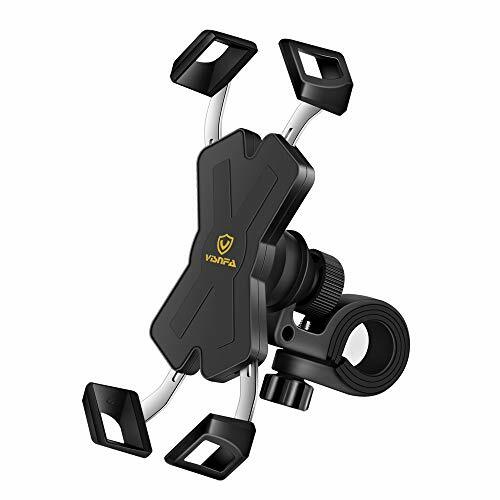 If you’re looking for a universal bike mount ideal for any device you have, then the Visnfa is the best choice for you. With its 4 stainless steel clamp arms, it can securely hold devices measuring 3.5 to 6 inches. It has a clockwork switch that effectively locks and unlocks your device without hampering its important ports and buttons. The phone holder has a sponge gasket that keeps your phone in pristine condition even if you don’t have a protective case. On the other hand, the clamp arms are made with nylon that rigidly grips the edges of your phone. The solid plastic and steel materials ensure that it will last for years, even if it accidentally falls. It’s also fast and easy to swap between bikes as it does not require any tools. The only downside is you have to use both of your hands as you need to turn the lever at the back part so that the claws open. 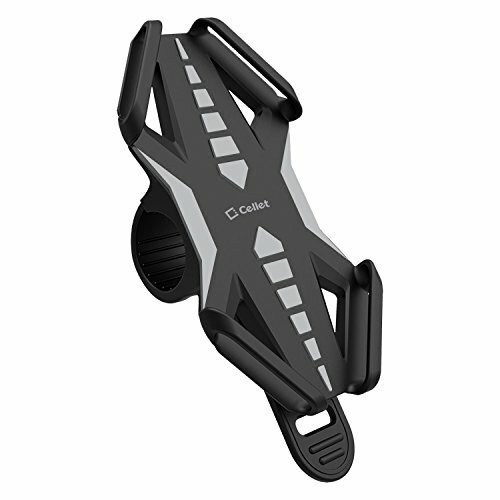 If you need something that really last, purchase the Cellet bicycle phone mount. It’s designed for bigger mobile devices measuring 4.3 to 6 inches. It is made from a single molded piece of high-quality elastic silicone that absorbs shocks and vibrations very well. Additionally, its improved construction doesn’t have any moving or glued part that gets busted or lost over time. To install, just attach the buckle on your handlebar and push it to the mount to secure the belt. For the phone, make sure that you put it in between the four bands around the edges. To top it all off, it comes with a one-year warranty! 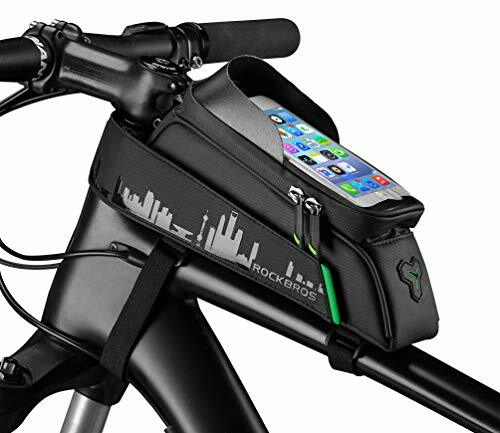 Rockbros offers accessories that have truly been useful and convenient for cyclists, making them one of the trusted brands by enthusiasts. If the weather cannot stop you to ride your bike, you have to make sure that your device is safe at all times. Excessive sunlight and unexpected rainfall can really damage your phone. For protection, the Rockbros bike phone mount is an inexpensive investment that you should have installed in your bike at all times. The Rockbros bicycle phone mount is made with a 2.0 Upgrade TPU touch screen that will allow you to access your phone instantly through face or thumbmark recognitions. For phone protection, the plastic keeps your phone dry while the visor lessens its sun exposure. This phone mount comes with a double zipper bag that is big enough to keep your gloves, wallet and keys. It is made with thick inner layer pads to ensure that your valuables are safe inside. Ready to Purchase the Best Bicycle Phone Mount? If you want to keep your phone handy while riding your bike or, you’re going to need a sturdy and reliable bike phone mount. Our recommendations are based on its sturdiness, functionality, and ease of use so we sincerely hope that you have found the best one that will attend to your concerns and needs.